Just a quick post to show off my first card playing with CAS-ual Fridays stamps! I have been wanting some of Michele's stamps for sometime now, this set is called Exclamations! LOVE, LOVE the sentiments and those little starry shapes! I used this week's Just Us Girls inspiration challenge and Karen's Sweet Sunday sketch challenge (use your fave sketch, so I chose #203) to pull all of this together! 3 challenges all rolled in to one cozy card! Hey yall! Happy Saturday :) Well fall sure has kicked in around here, I think the temps have dropped a good 30 - 40 degrees from summer already! This little lady is serving up a "hat-trick"... 3 challenges all rolled in to one dose of cuteness :) This is my Kraftin Kimmie challenge card for today, for INSPIRED BY NATURE The image is I Pick YOU, by Kraftin Kimmie stamps. 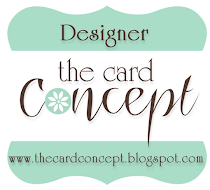 And the layout for my card is from this week's Sweet Sunday Sketch by Karen! 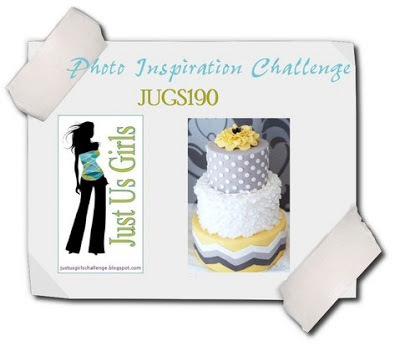 This week's JUGs challenge is a fabulous Photo Inspiration, brought to us by the uber-wonderful Elise (you'll want to head to the JUGs blog to read her post). This will also be my last post as a Jughead, it has been wonderful stamping alongside those wonderful ladies!!! I'm pairing up this card with this weeks Just Us Girls challenge, which is to use the "grid" technique! You can't tell in the picture, but I "brushed" the tiles with some Antique Linen and then dotted the crosses with some Espresso Liquid Pearls... looks kind of quilted! Happy Hopping! Yes, I know this post was due nearly 2 days ago... but better late than never, right?? I am sooooo loving these thunder storms and the huge down pours of rain, I am even loving the power outages at least until they cause me to miss a deadline :( Ok, well this weeks Kraftin Kimmie challenge is all about Fall Fun! And this week's Just Us Girls Challenge, is a fabulous sketch (see below). The images are from From Beyond the Grave, I just love how spooky the look :) Be sure to hop on over to the Kraftin Kimmie blog and the JUGs blog to link up your creations and to see more DT eye-candy from both teams! Thanks for popping by, hope to see you again!! Oh, and don't forget Kraftin Kimmie peeks start this week!!! Happy weekend!!!! Well today I am lucky enough to be the Hostess for BOTH the Just us Girls challenge AND for Kraftin Kimmie!!! At first I freaked out that I'd signed up for both on the same day, but then thought, "hey, 2 birds 1 stone yada yada". Sooooo this week's Kraftin Kimmie challenge is BACK TO SCHOOL, but for now this weeks Just Us Girls challenge is a photo inspiration (see the bottom of this post, or go here for the deets) so I took all of those school supplies and conjure up a pretty notebook! This is one of those Composition Books, and while it wasn't hideous it certainly needed some prettying up :) so I got down to business! I wanted this to be uber-cute, but sturdy enough to handle hibernating in a backpack between uses, so there is nothing "popped up with Sticky Thumbs" (which was harder for me than you can possibly imagine!!!) The "school rules" and those arrows are from the Silhouette Online Store. That black & white zig-zag ribbon was the perfect finishing touch and it covers the edges beautifully! The adorable little brain-iac is Lab Geek and she is another of my faves! I know, I know... I'm late :( and this picture is just sucky! I'll try to take a better one tomorrow when it isn't "storming" outside. This week's JUGs challenge is Monotone Blue's! so of course my mind went immediately to WINTER!! This cute, chubby FAT SNOWMAN is from Just Inklined stamps! I tried a coloring technique that is new to me, and honestly I think I LOVE it!!! I chose my blues that I wanted for 'shading' my snowman, but instead of 'coloring' I stippled instead... darker colors closer to the outline like normal. I used Gray's for the background and added some Sakura Stardust 'spots'. The sketch is this week's Sweet Sunday sketch from Karen! Happy weekend!! JUGs is celebrating 200 challenges!!! How fabulous is that? :) Today we have a fabulous sketch brought to us by the uber-talented Maria, and Inspired to Stamp is helping us celebrate! I've spent this week organizing my stamps and had no time to actually stamp :( For this weeks' challenge I decided to play with some Verve stamps! The flowers are from Petals & Stems, and the sentiment is from Dream Big. Head over to the Just Us Girls blog for all of the deets on the challenge, sponsor and to check out the eye-candy from the Juggies! Thanks for popping by, be sure to visit the Just Us Girls blog to link up your creation!! Kraftin Kimmie challenge: Anything Goes, JUGS198: Colors & RAM peek! Hey yall! Welcome to another day of peeks from Kraftin Kimmie! Today is Rachelle Anne Miller day :) Yup, we are peeking some A-DORABLE RAM images today, this one is called Cherish the Little Moments... so sweet! Oh yes and since it's release week, today's Kraftin Kimmie challenge is...... ta-da... Anything Goes! The sentiment is stamped in some Silver ink, I lightly touched the stamp to the pad because I wanted it less shimmery. The hearts are From the Heart Die set from Verve and are popped up with sticky Thumbs! Today is also my turn to Hostess the challenge over at Just Us Girls, and this week's a Color Challenge! You can see the yummy, summer-y colors I chose below. Happy Hopping and don't forget to visit the Kraftin Kimmie Blog for more deets on today's peeks & challenge, or head to the JUGs blog for more deets on my fabby-doo color challenge! Hello! This week's Just Us Girls challenge is to play with some Mixed Media! This would have TOTALLY freaked me out, BUT the brilliant Tobi recently did a post on using Gesso on the There She Goes blog and I've been dying to try it out!! This cute little tag is playing double duty and is also for my Kraftin Kimmie challenge which is Christmas in July)! This week's hostess for the KK Challenge is none other than the Fabulous Miss Kimmie herself :) Head over to the KKS Blog to see how you can win ya some free rubbah and for deets on this week's Frugal Friday Sale! Hey yall, happy weekend!! Todays creation is pulling "double-duty" for both my Just Us Girls and Kraftin Kimmie challenges. This week the fabulous & bubbly Elise is our JUGs Hostess with the Most-ess and she's challenging us to make some tags (a set of 4 to be precise)! Since my camera battery charger is still hiding in a box somewhere, I only get to show one for today. This weeks Krafty Challenge Hostess is Karen and she's chosen this super yummy color palette for us to work with (the colors remind me of Sherbet ice cream!). Here is my fabby gift tag! I used the Hip, Hip Hooray set from Kraftin Kimmie. I just LOVE this set! The streamers have a little Sakura Stardust on them, then I used the Stardust pen and added some "confetti" to the rest of the panel. I used a Sharpie White Paint pen on the balloons. I popped the yellow balloon up on a Sticky Thumbs and then popped the blue balloon up on two of them... LOVE the layered look! 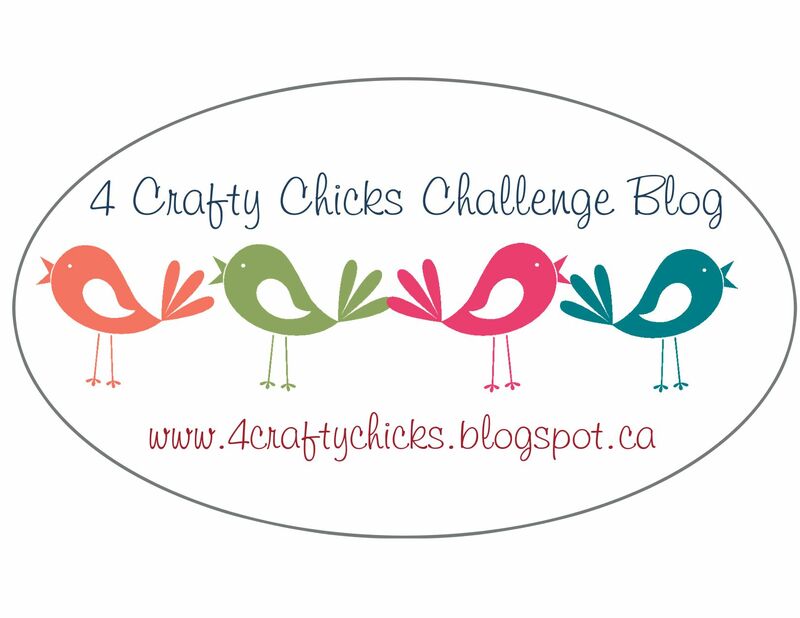 Be sure to visit the JUGs blog and the Kraftin Kimmie blog for more deets on both challenges! Happy stamping and hope you have a great weekend. Today I paired up 2 of my favorite challenges, Kraftin Kimmie & JUGs! This week's Kraftin Kimmie Challenge is brought to us by one of my fave stampers, Kim O and she's challenging us to Paper Piece!! I LOVE paper piecing! Head over to the Kraftin Kimmie blog for more details on her SALE!!! and to see how you can some free rubber!!! This weeks JUGs challenge is WASHI!!! I chose this Flower Dark Blue tape and the coolest thing is that it actually has 3 patterns in it (checkerboard, stripes & floral)!!! Below is the inside of my card. The challenge is to use washi tape and our sponsor is Modes4u. Modes4u is an online shop for cute stationery, fabrics, Bento lunch boxes, DIY clay sets, Re-Ment miniature toys and accessories, which are imported from Japan and the USA. The company based in Hong Kong was founded in 2007 by Managing Director Sandra Boch and always stocks several thousand kawaii products. Modes4u is an official San-X online retailer offering free international shipping for purchases over EUR 60 / US$78 / ₤ 54. The online shop is especially active in the field of social media, having more than 60,000 Fans on Facebook, over 4,000 followers on Twitter and an English and German company blog. The fun news is that Modes4u has given us 6 rolls of washi tape to give away! So we decided to randomly choose two (2) participants this week to each win 3 rolls of tape! All you have to do is play along using washi tape. Don't have any? No problem! Here are a couple of links demonstrating how you can make your own! Be sure to visit my fellow JUGHeads to check out more Washi fabbiness! Have yall checked out this week's JUG's challenge yet? Yeah, I'm a wee bit late (shhhh!). This week's JUG's hostess is Elise and she gave us an awesome sketch to work with!! Absolutely LOVE it! I dig out my Verve stamps for this card and I think it is just perfect for the Grad down the street! I think I'm getting better at masculine cards :) There are a ton of layers to this one, but it's still pretty CAS. Check out the sketch below, then go and check out my fellow JUGHeads! Don't forget to link up your creation!! Hey yall, I know it's a little late but here's my weekly Just Inklined card. I used the Corner Poppy sheet set, I LOVE this color combo!! The inspiration for this card comes from this week's Just Us Girls Photo Inspiration challenge (see below). I had some fun and added some Spica Yellow and Yellow Green glitter pens to the flower center and the "curly-que's" in the leaves. To make a "chevron" pattern look, I took some yellow and gray ribbons and cut the ends at an angle. I really just love the look of this card :) Thanks for popping by, hope to see you again soon! Just Us Girls #188: A WHITE Technique! Ok, so seriously, this could be one of my fave cards! This is my week as Challenge Hostess over at Just Us Girls and I'm challenging yall to use a white "medium" on your creation. Now it can be white ink, white crayons, white chalk, white pastel pencils... it's just gotta be white! Easy Peasy, huh? Well it was until I realized my White Pigment pad had dried out and so did the refill bottle!!! Dang-Blasted!! I knew I wanted to use the new Chalkboard Memories set co-designed by my gal Tobi Crawford so I decided to break out some VersaMark and White Embossing powder (if EP isn't a medium, it is now!;)). I also stamped it on In The Navy blue cs (from Gina K) instead of black. After getting everything embossed and pretty I took a #230 Pastel pencil and did some shading areound the images and then smudging with my finger. I used the same pencil to add some initials inside the heart (yup, this is gonna be hubby's b-day card!). I used From the Heart dies (from verve) for the red hearts on the "chalk board", the arrow is from the Arrow die (also from Verve). Voila! !